"Toni Smith’s stage show is dynamic, fun, unique and one of the top acts in the world..."
Toni Smith is an expert international circus hula hooper and physical comedian from New Zealand with over 17 years experience in Circus Arts. 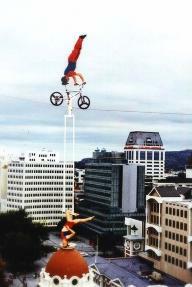 She has traveled the world with her street show, toured with a circus (and run away FROM the circus), dangled from a high wire 46 metres above the street and appeared on TV and in movies. She also trains dogs and has a degree in Animal Behaviour. Inspired by the great outdoors, Toni loves to ski, hike and bike. She loves to teach people to play and to overcome fears through personal challenges. She's here to spread a little joy and laughter around through the art of comedy and hooping! Toni believes life is to be lived, love is to be shared and laughter is the greatest gift.